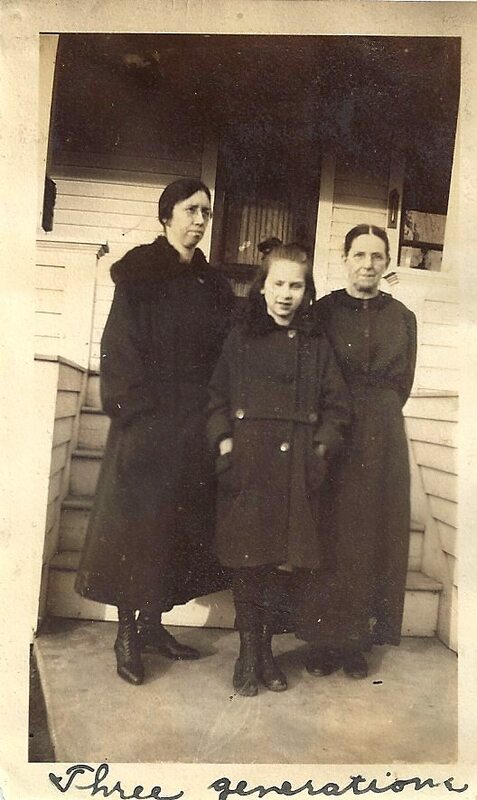 Grandma Dora as a child with her mother (left) and Grandmother (right). My Grandma Dora grew up as an only child. She lived near her grandparents, so I would guess that she spent a lot of time cooking and baking with both her mother and grandmother. Grandma Dora’s grandparents came to America from England as adults, so perhaps some of her cooking and baking skills had English roots. 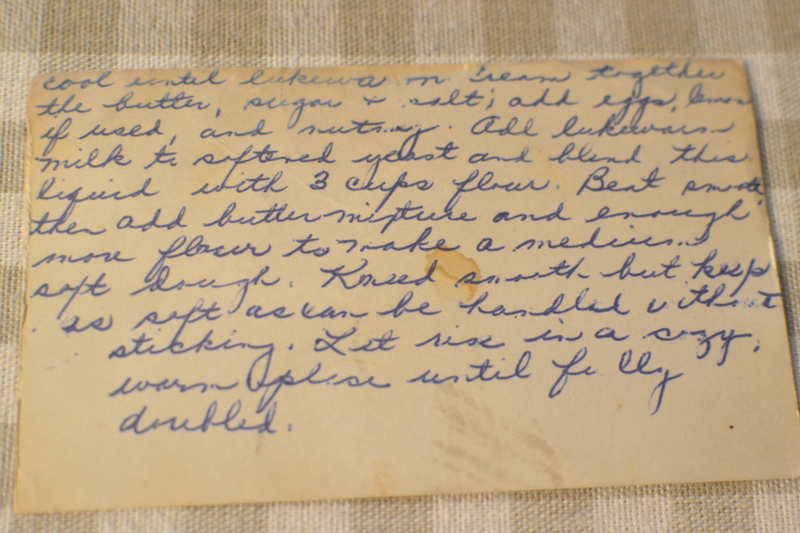 Many of the recipes from Grandma’s recipe box came from friends and neighbors, but I am sure some of them came from her mother and grandmother as well. In fact, some of them are written in her mother’s handwriting. 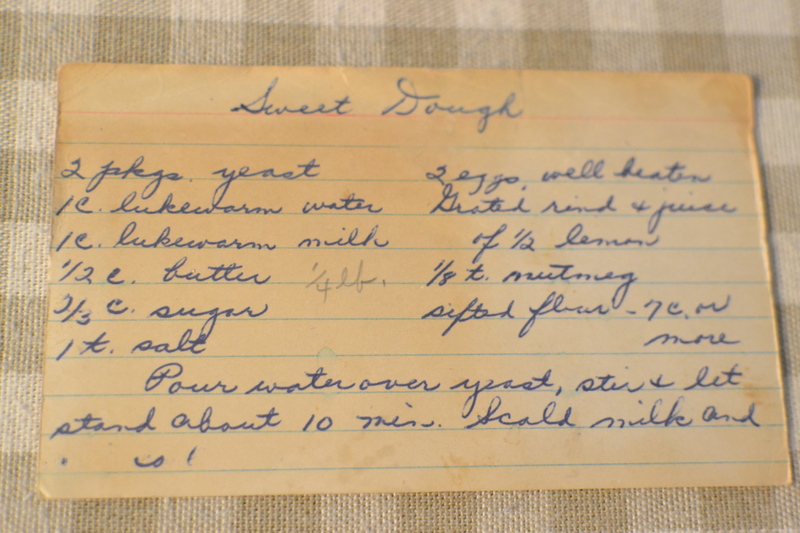 I like to imagine that this recipe for sweet dough is one that three generations made together. Pour water over yeast, stir and let stand about 10 minutes. Scald milk and cool until lukewarm. 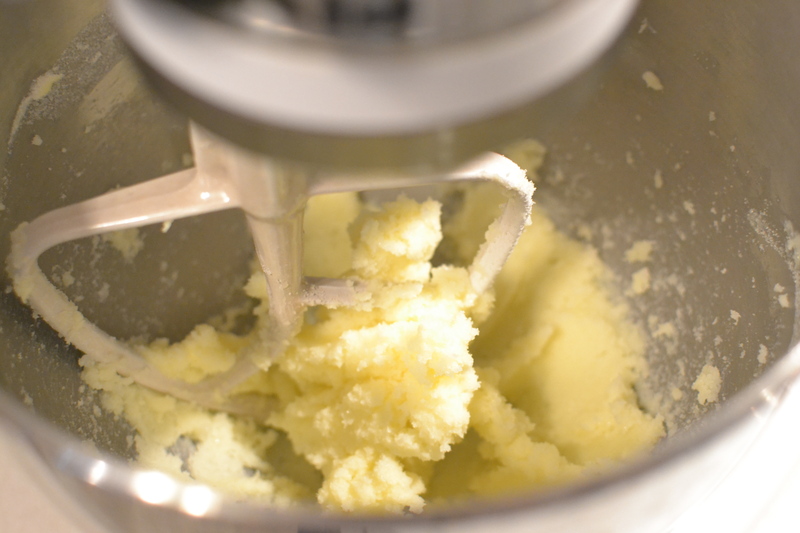 Cream together the butter, sugar and salt; add eggs, lemon if used, and nutmeg. 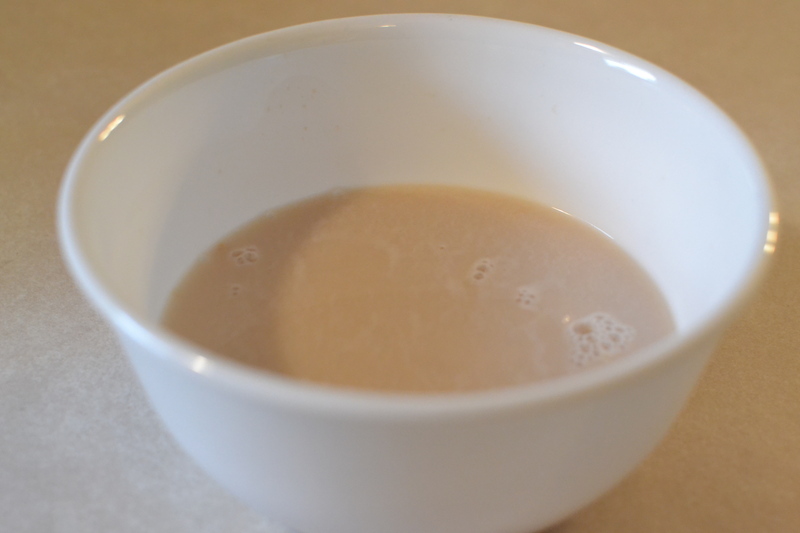 Add lukewarm milk to softened yeast and blend this liquid with 3 cups flour. 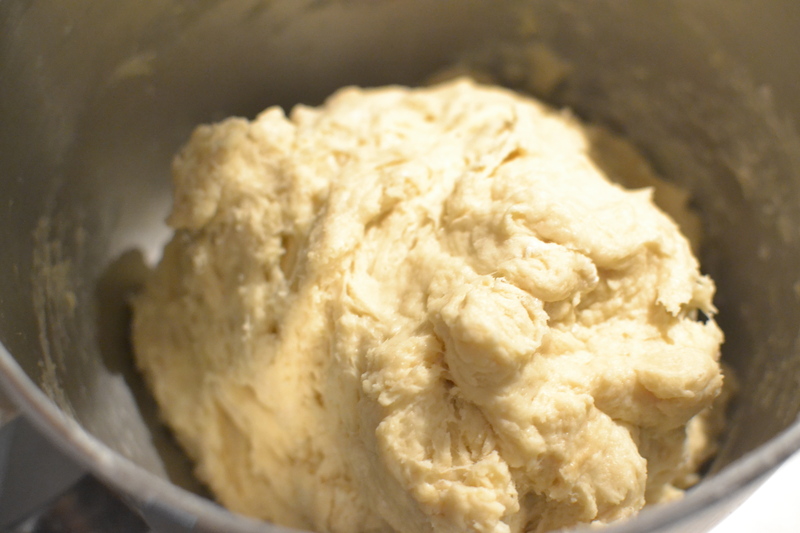 Beat smooth, then add butter mixture and enough more flour to make a medium soft dough. Knead smooth, but keep as soft as can be handled without sticking. Let rise in a cozy warm place until fully doubled. 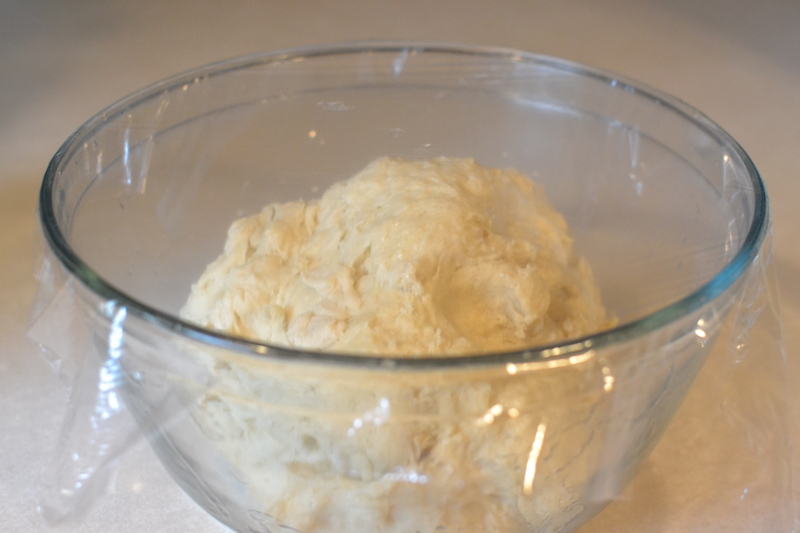 After the dough has doubled in size, punch down and flatten out on a lightly floured surface. Use a rolling pin to roll into a large rectangle. Spread with 4 tablespoons butter or margarine. 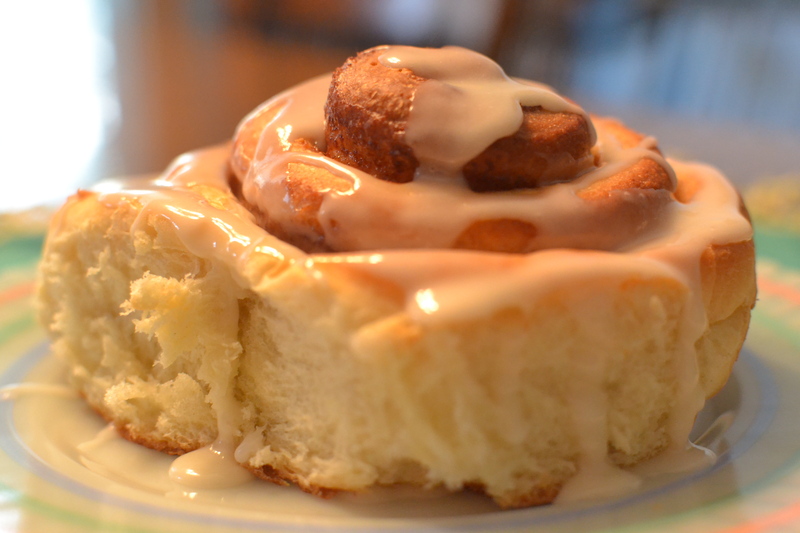 Mix sugar and cinnamon together. Sprinkle over the dough. 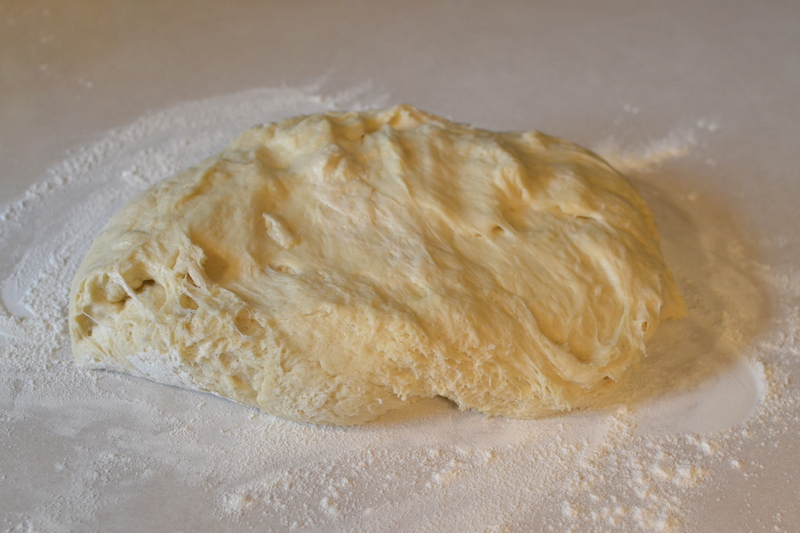 Roll dough up tightly; pinch edge of dough into roll to seal. 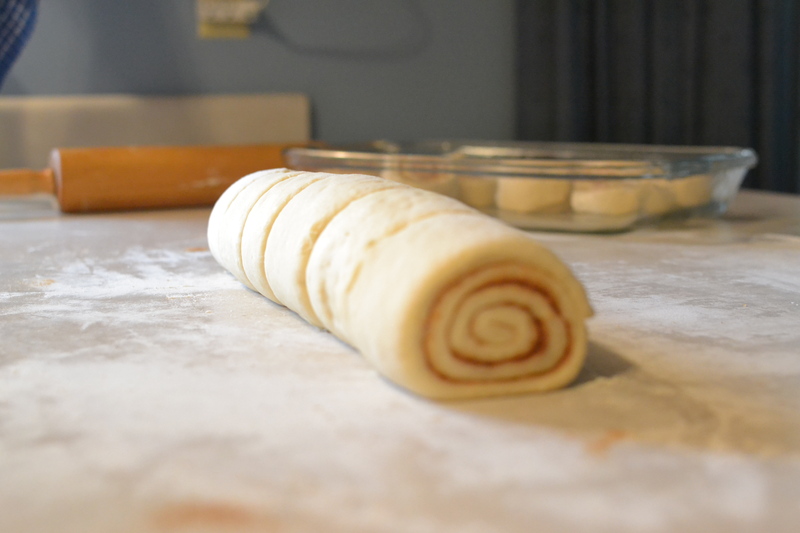 Cut roll into 1-inch slices. Place in 3 greased 9×13 pans. Cover and let rise in warm place 1 to 1 1/4 hours or until double. Heat oven to 375 degrees. Bake 15 to 20 minutes or until golden brown. Remove from pan to wire rack. Drizzle vanilla glaze over warm rolls. Mix 3 cups powdered sugar, 1 1/2 teaspoons vanilla and 2 to 4 tablespoons milk until smooth and thin enough to drizzle. Grandma Dora’s recipe is only for the sweet dough. I am sure it could be used to make different things such as sweet bread or even doughnuts. I decided to make it into cinnamon rolls as I’m sure my grandmother did many times. I used my own recipe for the filling and glaze. I am used to making cinnamon rolls by dumping all of the ingredients into the bread machine and letting it make the dough for me, so this was a little different. I stirred the yeast into the warm water and let it set. I scalded the milk on the stove and then let it cool. I creamed the butter, sugar and salt in the Kitchenaid. Then I added the eggs and decided to put in a tablespoon and a half of lemon juice (I didn’t have any whole lemons on hand.). I don’t like nutmeg, so I didn’t add it, but I’m sure it would be fine to add. I took the creamed butter mixture out of the Kitchenaid and put it in another bowl. 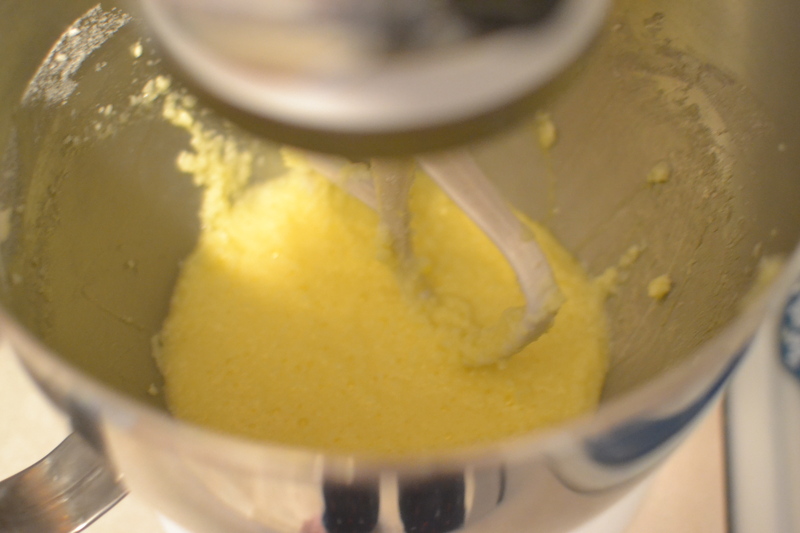 I then put the softened yeast and lukewarm milk into the Kitchenaid and added 3 cups of flour and then put the creamed butter mixture back in. After that mixed, I put the kneading hook attachment on and added about 4 more cups of flour (I could have kneaded it by hand, but decided to take the easy way out and use the kneading hook.). 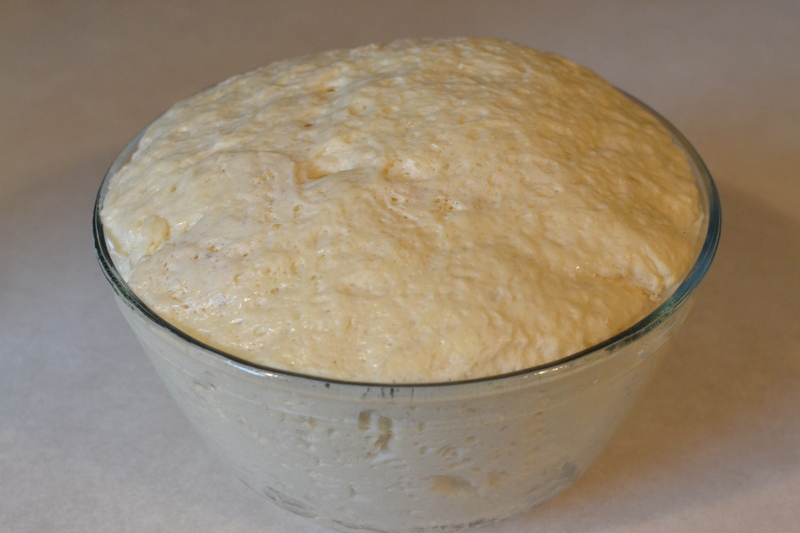 The dough was nice and soft, so I put it in a greased bowl and let it rise. I covered the bowl with plastic wrap so the dough wouldn’t dry out. I punched it down and put it out on the lightly floured counter. 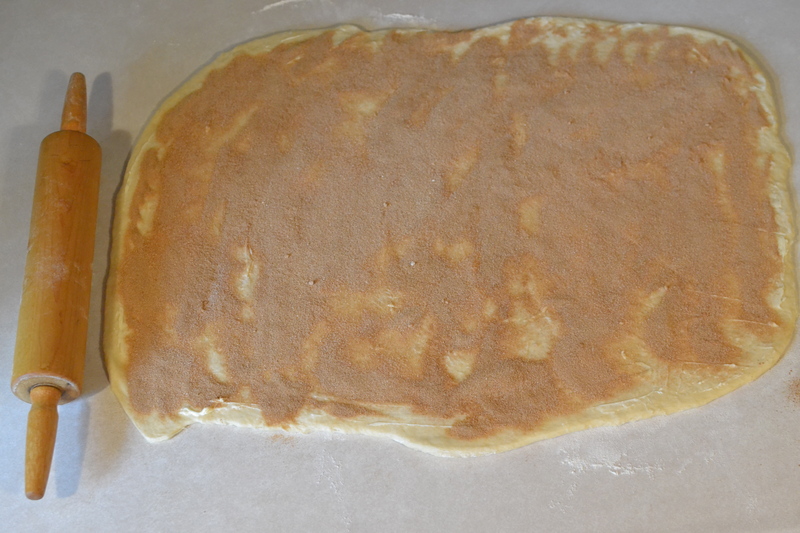 I then rolled it out, buttered it, sprinkled on the cinnamon and sugar, and rolled it up! I cut it into 1-inch slices. To do this, I used a piece of floss. I put the floss under the roll, then brought it up and crossed it, so it would cut. After all of the pieces were put into the greased 9×13 pans (this makes a BIG batch and they need space in the pans so they can raise) I covered them with plastic wrap again (I grease the plastic wrap so it won’t stick) and let them rise. Once they were doubled, I popped them into the preheated oven and baked until golden brown. 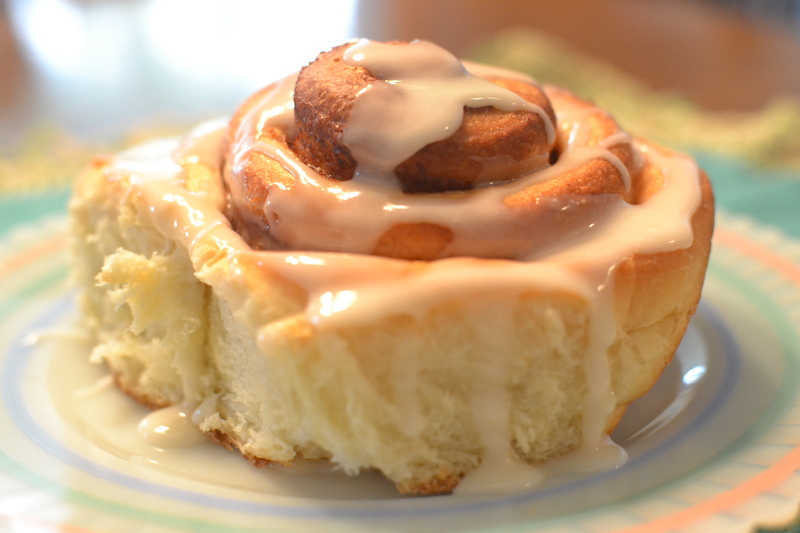 They turned out beautifully and were even more beautiful with the frosting. Because they made such a big batch, I shared them with my family and even a neighbor. All of these instructions may make them sound very complicated, but it really wasn’t too bad and it was well worth the effort! I hope you give these a try. You’ll have plenty to share, which is always fun! This entry was posted in Breads, Breakfast, Frosting and tagged baking, Bread, Breakfast, brown sugar, cinnamon rolls, dough, farm cooking, grandma's cooking, scratch cooking, sweet bread by GrandmothersRecipeBox. Bookmark the permalink. These look awesome! Mine are rising as I type. Look to be nice and fluffy! Thanks Rebekah! Glad you baked them. How’d they turn out? The dough was great and so easy to work with! More like a pastry dough. I made a cream cheese frosting instead of the glaze because that is what we like! I also like that it made 3 pans instead of 2 so I was able to give some away and we still had plenty to eat for dessert and then again for breakfast the next day. The whole family loved them!